Just because it’s acknowledged to be one of the best, and snazziest, resorts in the world, doesn’t mean Whistler Blackcomb backcountry is anything to shake a stick at. 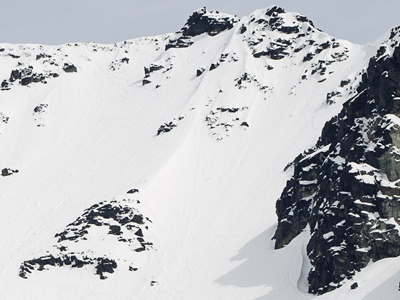 Au contraire—there is endless terrain to tour on, either off the mountain or nearby. Most of the tours are in Garibaldi Park and range in intensity from heavy duty (McBride Range) to mellowish (Garibaldi Lake—look for the Varsity Outdoor Club cabin at the east end, it's called the Burton Hut). 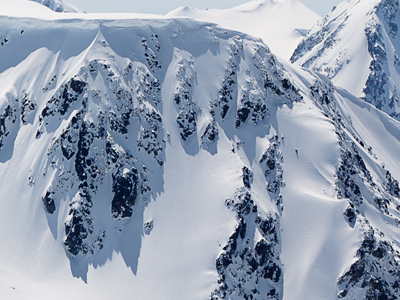 Ski tours can range from day trips to multi-day tours or traverses. If you are accessing the backcountry from points other than the resort, bring chains for your vehicle, which should be a 4X4. 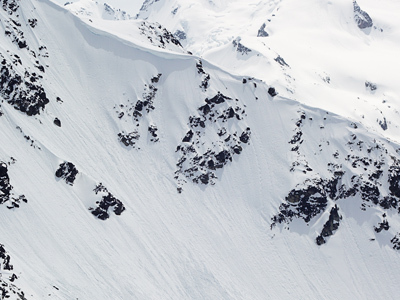 Being a part of the Coast Range, Whistler Blackcomb enjoys consistent snowfall and some classic big mountain ski touring. 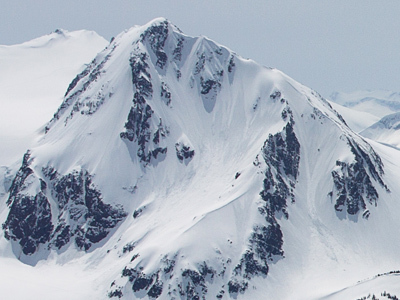 As in most ski hotspots, there are many guiding services available to help you find the goods in the backcountry. Just ask around. We want to hear about your adventures in the Coast Mountains so don’t forget to post a trip report in the backcountryskiingcanada.com forums. If you have a new route in the area you want to share, mouse-on over here. N-Joy. Flute Backside has runs of around 300 vertical meters with a very pleasant pitch for gentle powder skiing (pictured). 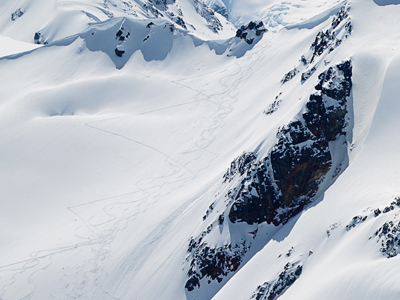 Full route description including details on access, ascents and descents in the Whistler & Area Ski Touring Guide. These are an assortment of runs known collectively as The Apostles. There are about half a dozen different routes to choose from on the east flank of Oboe. 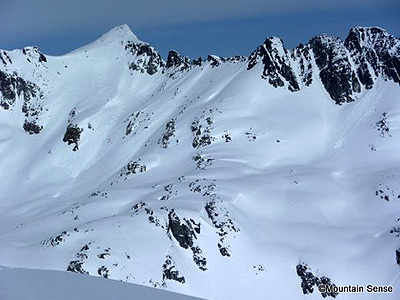 The snow on Cowboy Ridge is generally not as deep as found on Oboe, but there are usually less tracks as it requires climbing another ridge after skiing The Apostles. 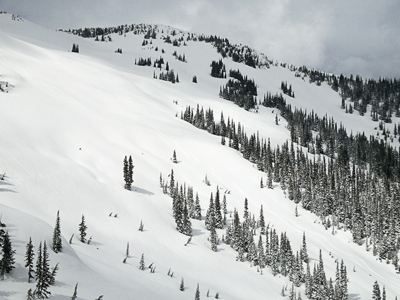 The most prominent peak visible from the resort, Fissile is a classic route for backcountry skiers looking for a long, consistently steep descent. Another area frequented by the resort skiers looking for fresh lines is Disease Ridge. 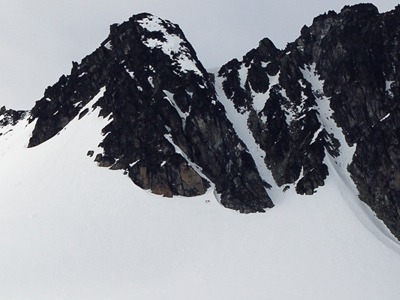 The Disease Ridge has large cornice build up and should be approached with caution. 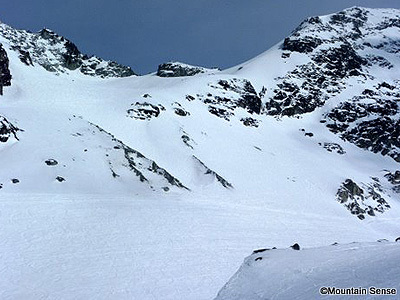 This NW facing couloir north of the Spearhead offers 250m of skiing up to 40° down to the Blackcomb Glacier. 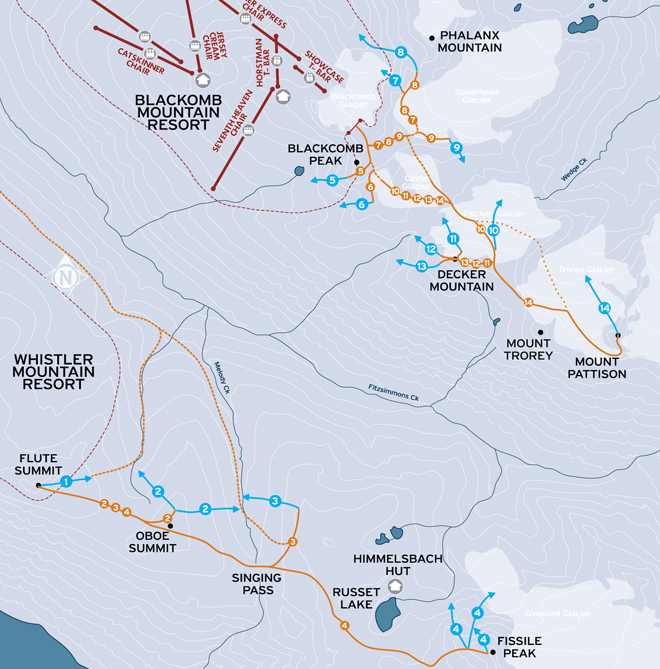 Re-enter the ski area boundary by skiing down the glacier to the Blackcomb Glacier road. ACCESS: From the Blackcomb base station take the Wizard Express and Solar Coaster gondolas, then ski the Jersey Cream run to the Glacier Express and Showcase chairs to access the Blackcomb Glacier. 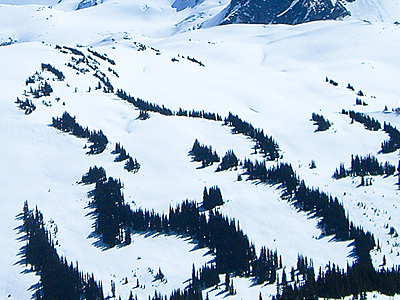 This NW & W facing bowl SW of Phalanx Mountain offers 250m of skiing in the 35-40° range down to the Blackcomb Glacier. From the backcountry area boundary, traverse the top of the Blackcomb Glacier and ski down to its bottom right (SE) corner. Skin up to the south until it is possible to head east and NE to gain the south ridge of the Spearhead and contour across to the east ridge. From here several options exist to drop down onto the Spearhead Glacier (easier the further east you go). Once on the glacier contour left towards the col just SW of Phalanx Mountain to the start of the Corona Bowl. 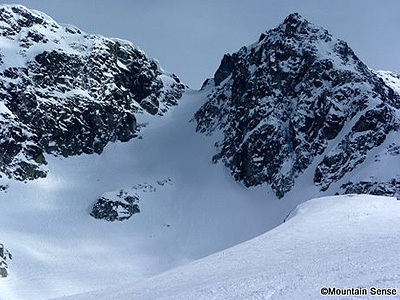 Several options exist on the steep lower slopes to reach the Blackcomb Glacier with the easiest being “She’s Tight” following the moraine on the skier’s right. Named after the steep and tight chutes reminiscent of the French Alps, Chamonix Chutes (like DOA) will often only hold great powder for the first few skiers that descend them. Decker Mountain is the perfect backcountry day trip. The distance from the resort is far enough to separate your party from the bootpack crowd, yet the exit back to the resort is still relatively quick. 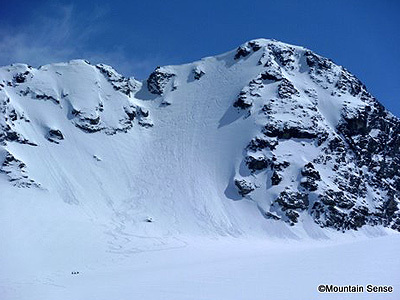 9th Hole sits adjacent to Decker Glacier and is a steeper (but shorter) descent with features such as windlips and cliffs that can be skied if desired. The Finger Chutes are a steep, exposed set of chutes that drop off the NW face from the summit of Decker. Main chute is the longest and most sustained of all the runs on Decker Mountain. Although steep, it is not exposed to cliffs below and is less susceptible to cornice build up than 9th Hole. A more distant peak that offers great views and requires a few runs along the way. 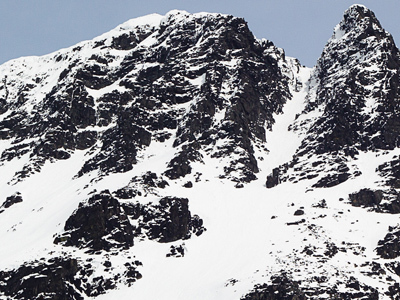 The NW Face is 190m long with 40° skiing but can be skied down the Trorey Glacier for a nice 500-600m run. From the backcountry area boundary, traverse the top of the Blackcomb Glacier and ski down to its bottom right (SE) corner. Skin southward up to the Blackcomb East Col and ski the Circle Glacier, contouring over to the Decker Glacier where two options are possible. Either ascend the glacier to the col east of the summit, or if cornice hazard off Decker is too great, contour around towards the NE ridge and gain the ridge at a flat spot above 2200m and climb the NE ridge to the top. 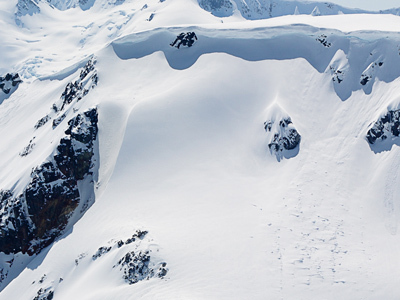 Now ski south to the Decker-Trorey Col and traverse high across the Trorey Glacier. Note that in good stability it is possible to drop down onto the Trorey Glacier from the 2200m flat spot on the Decker NE Ridge and save a lot of up and down. Skin up the Trorey Glacier to the Pattison South Col via a steep boot pack at the end and continue up the South Ridge to the summit of Mt. Pattison. Drop down the North Ridge of Pattison a short way until it is possible to enter the NW Face via a break in the rocks. Ski down as low as you like on the Trorey Glacier before ascending the glacier to retrace your steps up and over Decker or via the flat spot on the NE Ridge. Cross the Decker Glacier, skin up the slopes below the Circle Glacier and ascend the SW half of the Circle Glacier to the col east of Blackcomb Peak. Just getting on top of this pointy summit is pretty cool, so once you ski the 330m fall line shot down the SE Face, you’ll have it all. From the backcountry area boundary, traverse the top of the Blackcomb Glacier and ski down to its bottom right (SE) corner. Skin up to the south until it is possible to head east and NE to gain the south ridge of the Spearhead and contour across to the east ridge. From here, a boot pack leads quickly to the summit. The wind scoured top pitch might be boney enough to warrant a lower start to the ski descent but if you’re lucky enough to have good coverage then ski it straight down to the flats on the Circle Glacier below. 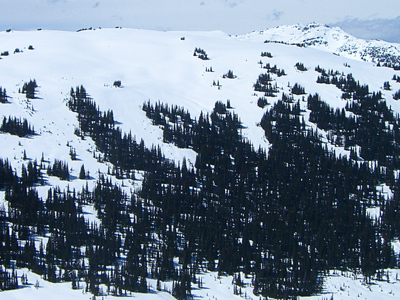 Skin up the SW half of the Circle Glacier to the Blackcomb East Col.